At least 20 people were killed and 54 were injured on Friday when a ruptured pipeline exploded in central Mexico as people were trying to fill up containers with fuel, the government of Hidalgo state said. Mexican television footage showed flames leaping into the night sky as the pipeline burned in the municipality of Tlahuelilpan near the Tula refinery to the north of Mexico City while people shouted and cried for help, reports Reuters. Lopez Obrador expressed his concern on Twitter, and said he wanted “the entire government” to help people at the scene. 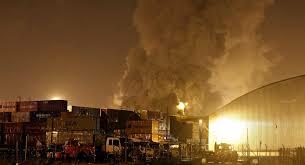 Separate television footage showed the pipeline gushing fuel earlier in the day and people moving in with containers. “The preliminary report I’ve been passed is very serious, they’re telling me 20 people have died, charred, and that 54 are injured, burned,” Hidalgo state governor Omar Fayad told Mexican television.